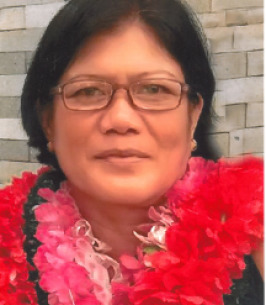 Gloria "Glo" Ranada Ustil, 55, passed away on October 12, 2018 in Honolulu, Hawaii. She is survived by son, Mark Glenn Ranada Ustil, daughters- Mitzi Gay Vega, Christianne Mateo, Liezel Ustil; brother Nelson Ranada, sisters: Edna Quintana, Elsa Walet, Melia Ranada, Filamer Rabaja and Ester Ranada. Funeral services will be held on November 2, 2018 at Ballard Family Moanalua Mortuary. Visitation is at 5:00 pm services at 6:00 pm. Burial will take place in the Philippines. To send flowers to the family of Gloria Ranada "Glo" Ustil (Ranada), please visit our Heartfelt Sympathies Store.